Light novel covers sometimes get a bad rap. Some LN series do admittedly just have an artwork of the lead heroine posing in front of a plain background, which–to me at least–isn’t particularly interesting. 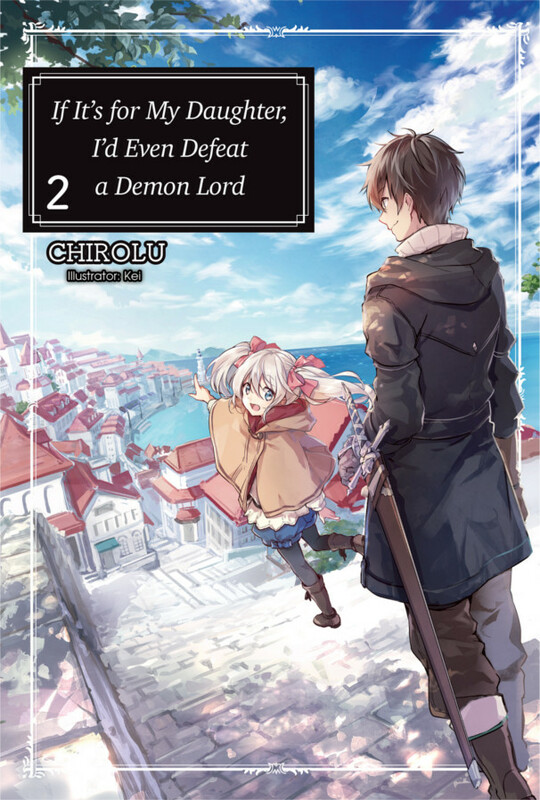 (Especially when it’s the same girl for every single volume…) But there are still plenty of light novels out that feature dynamic covers illustrated by their talented artists, and today I’m going to go over ten of my favorites. For this article, I will limit myself to English release covers. But before jumping into my top 10, I’ll start with an honorable mention. My favorite light novel artist is Miho Takeoka, but the only series in English that features her illustrations is Book Girl. And the covers for that series are all just straightforward shots of lead heroine Tohko posing (which, as I mentioned, isn’t that attention-grabbing for me). In Japan the background for all these covers is a blank white–but for the English release Yen Press added a kind of sepia tone library photo background for them, and made the Tohko artworks look like they were drawn on ripped pieces of paper. The end result is… okay. The only cover I think looks good actually is the one for volume 3, where the coloring of the artwork and the background (which is actually just a rug in this case) seem to mesh together much better than all the others. Also, the way Tohko lies on the ground with scattered books about her is a more unusual pose, so it’s my favorite artwork of the bunch too. That bear. I couldn’t help but laugh when I first saw this cover. Here we see our hero Reiji striking a cool pose alongside his brother, our viewpoint of them looking slightly upward for dramatic effect. But unfortunately–or perhaps fortunately, I should say–said brother is in a ridiculous theme park bear costume, and even appears to look pleased with himself about it. Very funny. I also rather like the colors for the background, which appears to be a massive castle or temple adorned with foliage. Isn’t it lovely? I’d be interested in seeing a full painting of just the background, especially if it continued on to the left and right a ways. Curious to see how the whole building looks. Yoshitoshi ABe is a favorite artist of mine, known for his work in anime such as Serial Experiments Lain and Haibane Renmei, as well as light novels such as this and Welcome to the NHK. His art style feels like a perfect fit for All You Need is Kill. 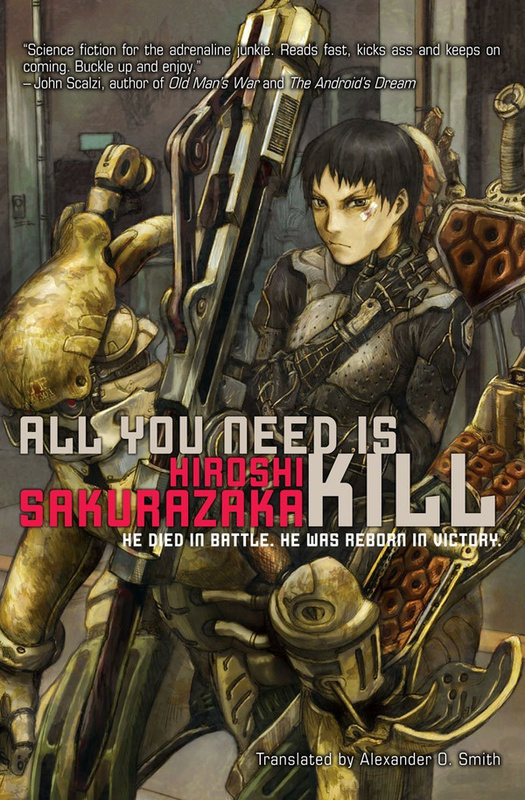 The cover depicts Keiji getting in a kind of battle armor called a Jacket. The machine itself looks great, with just the right amount of detail. It looks realistic, but also doesn’t feel too “busy.” I particularly like the geometric pattern of the mech suit’s interior. And as for Keiji, I really like the pose and expression that ABe has depicted him with. The endless battles with the aliens are wearing him down, and he knows that even death won’t bring him rest–but still, he keeps fighting. All the covers in this series are quite nice. Each cover illustration appears to depict a scene from the book actually playing out (i.e. artwork that captures a moment in which the characters are in the middle of doing something), which is something I personally like for book series. Here for volume 2 of If It’s For My Daughter, we see Dale and his adopted daughter Latina walking down a steep brick path into a quaint seaside town. The illustration really captures the feel of a light and breezy, carefree day–a welcome reprieve from all the more action-oriented fantasy titles. I also like the detailed shading for the shadows the nearby tree is casting. A very striking cover! Durarara has a lot of covers that really capture the feel of “anything can happen at night in Ikebukuro,” some of them more stylized than others. 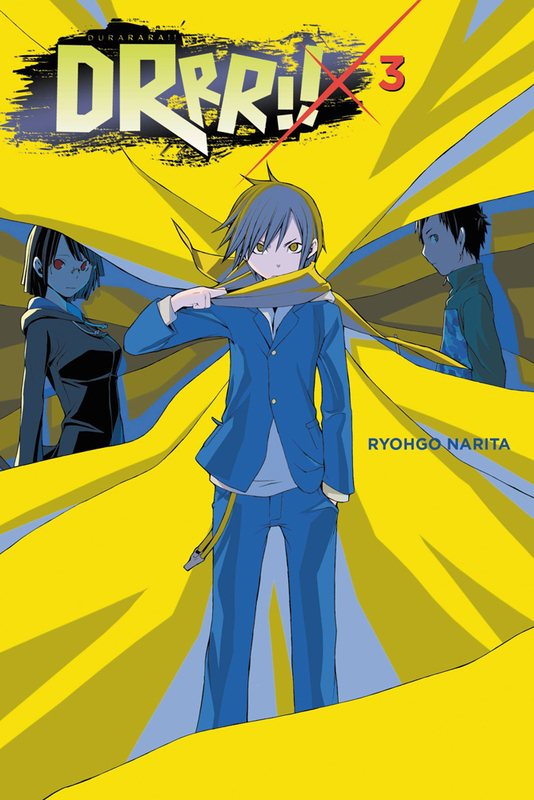 The artwork for volume 3 is definitely the one that jumped out at me the most though, if only for how much of it is filled with the cloth of the Yellow Scarves, one of the central gangs of the Durarara series. In the very center, Masaomi stares directly at the reader, his eyes practically glowing with defiance. And behind him, caught up among the layers of cloth that forms a kind of criss-crossing intersection, are his friends Anri and Mikado. 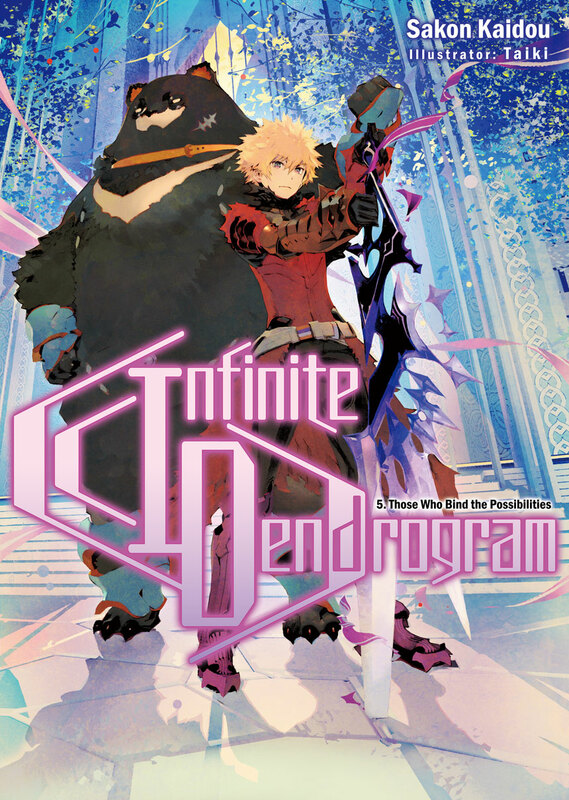 It’s a perfect image for this volume, as the paths of these three characters all collide once their dangerous secrets are revealed to one another. 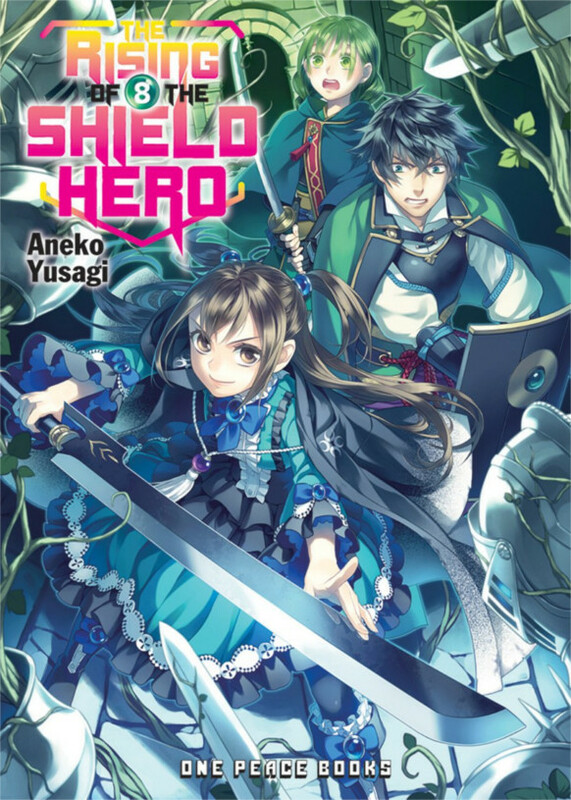 This isn’t a series I’m personally into, but I do appreciate just how adventurous some of the Shield Hero covers are. Most of the covers feature a kind of montage that packs in a large number of characters, but a few appear to depict specific action scenes, such as the one for volume 8. Here we see a battle of swords and sorcery, as I presume magic has conjured up these vines. It all looks quite exciting. I particularly like the defensive pose of the girl up front (looking up the name now… this is probably Kizuna), as well as all the details and folds of her dress. The way her index finger is raised above the blade is a fun little touch. 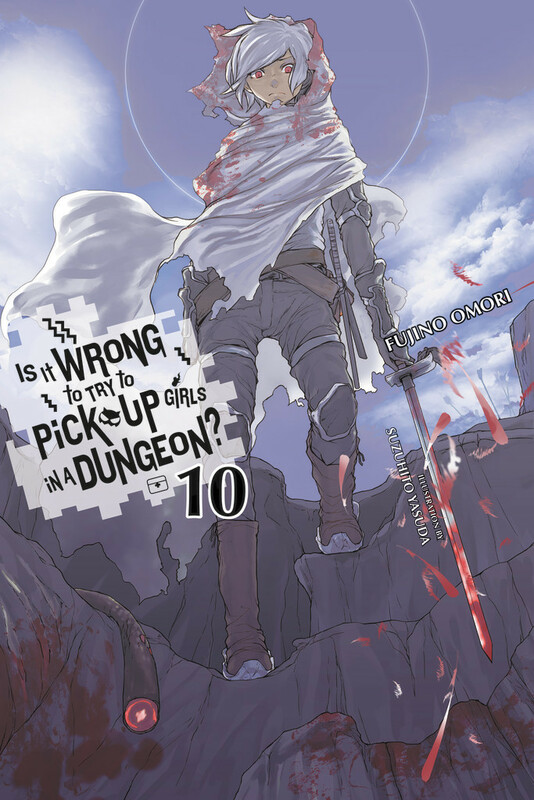 This is another series I’m not into, but the cover for volume 10 definitely stood out to me. The illustration (by the same artist for Durarara, I’m only now noticing) depicts the protagonist Bell, who appears to be looking down upon an enemy he has defeated in a bloody battle upon some rocky wasteland. Judging by the amputated tendril, I’ll assume it was a monster he killed. I really like the composition of this cover art–it feels very imposing. Is the circle of light behind Bell a bit much? Maybe it’s chuuni, but light novel audiences shouldn’t mind, right? 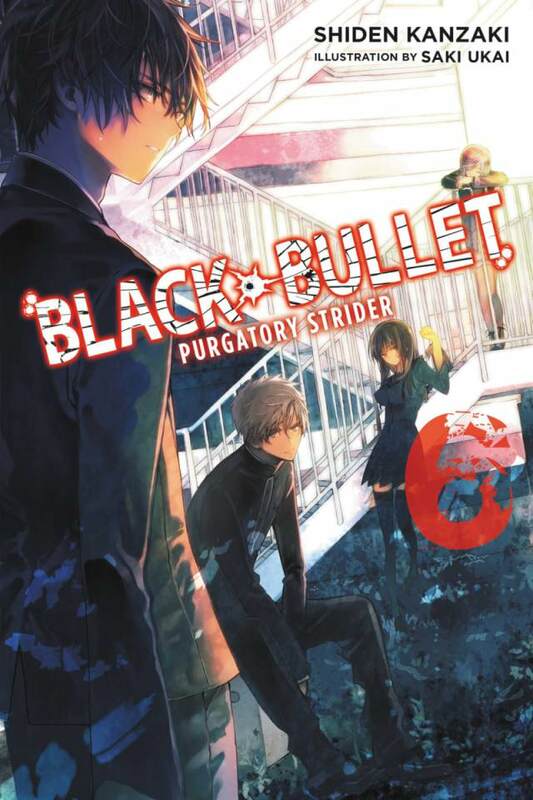 Volume 6 of Black Bullet looks like it could be an album cover. Saki Ukai is an excellent artist in general, and I especially like this illustration’s use of lighting and shading. The blinding white metal stairway contrasts nicely with the dark ground and characters dressed in black. The way each character is positioned seems like it could reflect their personalities to some degree (I can’t be certain as I haven’t read this series), but I particularly like how the child in the back is resting on the arm rail. Reminds me of a sleepy cat basking in the sun. One more thing I want to point out: the design of the series logo, the text placement in general, and the way the volume number is stylized are all pretty neat. All the covers so-bin has drawn for the Overlord series are splendid, and they definitely stand out among all the light novels currently available in English. Each painting is dark and beautiful, capturing a moment (often a dramatic one) from the story with a fantastic level of detail. I feel most of the covers have a bit too much going on though, so that’s why I picked volume 3 for this list, which is more readily clear about what’s going on. 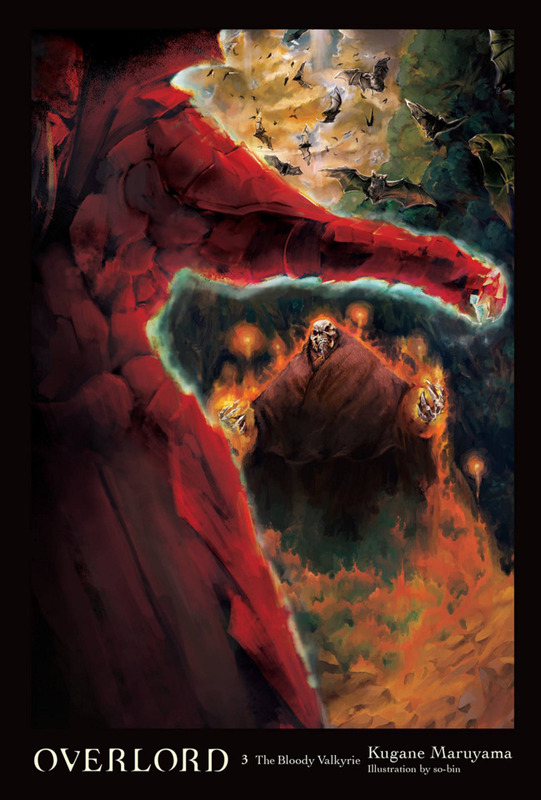 Our focus is on the skeletal overlord Ainz, facing a mysterious enemy who stands in the foreground. I particularly like how the clouds above are colored, and the flock of giant bats circling nearby certainly helps set the mood. 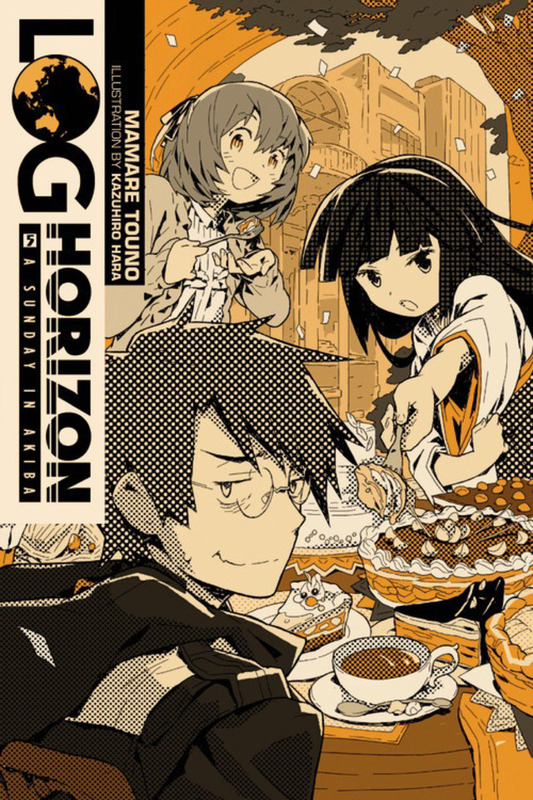 I’m a big fan of all the covers Kazuhiro Hara has drawn for Log Horizon, which has a very nice variety to them in terms of characters featured and the general mood of the scenes being depicted. The way each cover works with only a few colors and is shaded with dots (reminiscent of manga screentones) gives them all a unique look. I had a hard time picking which one I wanted to include in this list, and had to do a toss-up between volumes 4 and 5. I settled on 5 though, just because I think it’s hilarious. Here we see Akatsuki and Minori both trying to feed our reluctant protagonist Shiroe some pie–instead of eating though, Shiroe looks back with a weary expression toward the reader like the lead in some cheesy sitcom. I like it when a series can spend a moment like this to not take things so seriously. Contrasting with my #2 pick, here’s a much more serious cover–one that is so much so, it caught me completely by surprise when I first saw it. Honestly, I don’t think I’ve ever seen a book cover that captured a menacing mood so strongly. Fitting the subtitle for this volume, the cover illustration by Sidu is very dark, save for the two characters’ demonic eyes and the blood(?) colored in a toxic yellow. 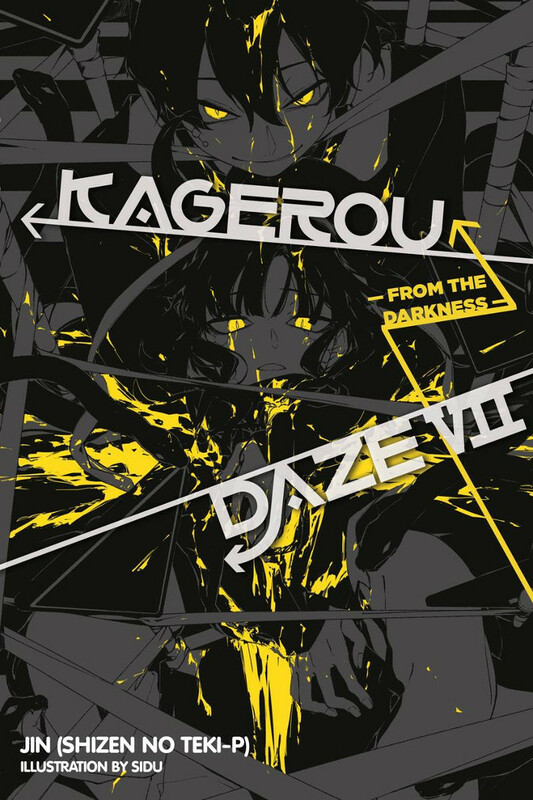 I find it interesting how all the other covers in Kagerou Daze are mostly left a blank white, with one or two bright primary colors for accent. Volume 7’s cover is thus intended to contrast as strongly as possible with the rest of the series, and it really does pack a punch. Along with the artwork itself, I’m also a fan of the typesetting for the title and subtitle. It’s a cool-looking font, and I like how well the angles of the lines and arrows seem to add to the tangle of criss-crossing bandages and limbs underneath. At the bottom of the abyss, it’s a chaotic and grisly web of madness. And that’s it for my list. What are some of your favorite light novel covers? Feel free to share your favorite cover illustrators, and what it is you like about their artwork. ← New J-Novel Club Title: Me, A Genius? There are some interesting covers on this list. I’m only at book 3 of Rising of the Shield Hero, but I do really like the distinctive design of most of the covers so far. Thanks for sharing a great list. I’m actually surprised Rokka didn’t make the list. Back when the anime aired I took one look at the covers and went “I need someone to get this series.” I do have to agree on Overlord’s covers, those are just breathtaking. Rokka was a series I was strongly considering, as I do like the artwork in general for it (particularly the color inserts). Of the three volumes in English though, I couldn’t think of a cover that stood out to me most. I also have mixed thoughts on the white scribbles and magic seal randomly placed on top of the artwork. I second Rokka. That Baccano! cover at the top of the post looks pretty impressive as well. Baccano volume 5 is very lovely — I really like the lonely atmosphere being conveyed with the background in particular. It also contrasts with most of the other covers in the series, which typically have a fun, classic adventure feel to them. There are a lot of series getting releases right now! Be sure to look around and see what stories might interest you most. This is a nea list, all the covers are quite unique,striking or beautiful. Book girl sounds intriguing, have you read it? Is it any good? 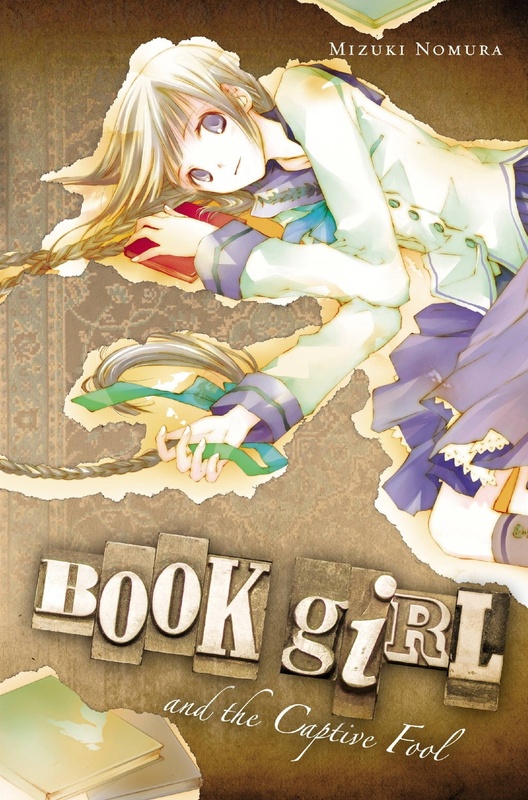 Book Girl is my personal favorite light novel series, and you can find reviews for all eight volumes here on this blog. I recommend giving the first volume a try to see if you’d like it. (It’s titled “Book Girl and the Suicidal Mime.”) A high school drama series with mystery and romance, and a lot of references to classic literature. Thank you, I’ll check out your reviews sometime. Hopefully it’s available at my library, because it sounds right up my ally. So far the only light novels I’ve read are sao, so I’m hoping to find something else that is both good and available. I’ve read lots of lightnovels (mostly free ones) but unfortunately i couldn’t find most of them good. Overlord is one of my favorites And there’s a Chinese novel called “my disciple died yet again”; that’s quite good too. Now I’m really interested in your list here. Can’t wait to check out log horizon. Good job making this post!